We are in the thick of a six-week surfing extravaganza in Hawaii right now, and for the WSL CT title, you have to put your money on Gabby, unless ... writes Craig Jarvis. Kelly (although not John John) will be competing in the Pipe Master and as we know, Kelly is a spoiler. Another spoiler has emerged in Joel Parkinson, winner of the Hawaiian Pro and without a doubt aiming for a Triple Crown victory as his swansong. 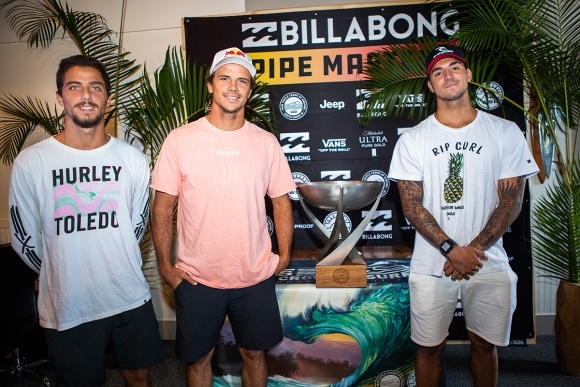 Both are standouts at Pipe, with both Joel and Kelly previous Pipe winners, so they know their way around the reef. He didn't get a wave because he was too scaredThe contenders are Gabriel Medina, more than 4,000 points ahead of his nearest rivals Filipe Toledo and Julian Wilson. But Toledo has little chance of winning the 2018 World Title at Pipe, and for the high-flying natural-footer, it comes down to nothing else except experience. Many people have written him off already for being a bit hesitant on the big drops after one really bad heat at Teahupo’o where he didn't get a wave because he was too scared (back in 2015). The problem with Toledo is more about experience. Martin Potter wasn't a great fan of massive waves, but as he grew more experienced so he started charging everything, and Kelly had a policy of adding two foot to his wave height ceiling every year in Hawaii, and in the short space of five years he was surfing 10 foot+ waves. As Toledo gains experience and the hunger for a world title, he’ll overcome his big wave inadequacy, but not this year. The only chance he’ll have of a victory is if the North Shore goes flat and the waves at Pipe resemble a little beachbreak somewhere. It has happened before. I remember sitting on the sand watching Bede Durbidge win Pipe in 2007 by surfing three-foot high-tide and wobbly rights on the inside of the Backdoor reef, and doing close-outs on the shoreline for victory and the Triple Crown win at the same time. That year would have suited Toledo. 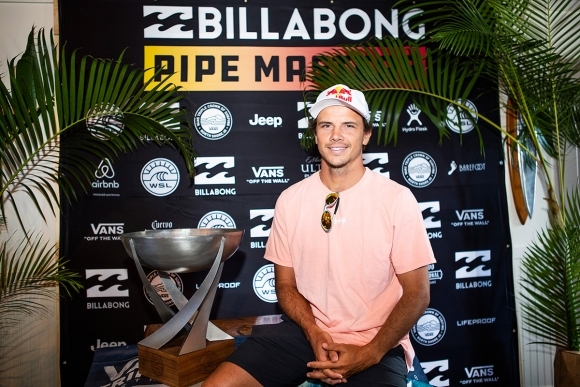 Julian Wilson has a very good chance of winning the World Title this year at Pipe, and has an incredible year thus far with wins at the Quiksilver Pro Gold Coast and the Quiksilver Pro France, and a win at the Pipe Masters back in 2014. He has grown as a surfer the last year, and his performances have been exciting and dynamic, stepping out of his comfort zone, especially when it comes to aerial surfing and throwing it out there when he needs to pull out all the stops. He has also grown as a tactical surfer, and it’s clear to see that he is thinking about things more than usual, possibly due to the help he has been getting help from Andy King, but it seems that the lad has matured as a surfer and is destined for greatness. The only possible negative is that Julian is too much of a nice guy at times, and doesn't have enough of the mongrel in him. There’s very little emotion of he wins or loses, and he often seems outwardly complacent in tense situations or with obtuse judging decisions. It would be good to see him throw a wobbly and do a Bobby Martinez on the live broadcast, or threaten another surfer on TV like Gabby warned Glenn Hall in Australia, or even a passionate rock stomp to retirement a la Freddy Patacchia (without the retirement). Gabriel Medina however, has an excellent chance of winning the 2018 World Title at Pipeline on Oahu this year. He has the combination of enough elements to make him the most dedicated and passionate surfer in the mix as we go into the final Championship Tour event of the year. He knows what to do to win a heatHe has the experience at Pipe, and at other sold lefts on tour like Teahupo’o. He has the reputation of catching the set waves, riding them all perfectly, and getting good tubes on those waves at those venues. He rarely goes on the outside sets, and he wipes out even less. He knows what he needs to do to win a heat and does it almost methodically at places like Pipe. He is also hungry for a world title. He has already tasted the sweet taste of a crown, and he wants it again. The adulation and worship from his countrymen is something that he no doubt wants to experience again, and he now has that chance right in front of him. On top of that, Medina has one of the best air games should the waves get poor, so he still has the nous to beat a surfer like Toledo should the conditions be unfavourable. He doesn't have a victory at Pipeline under the belt either, so it would be a great way to finish the year with the Pipe Masters helmet leading on to a second world title. It will be a massive surprise to all should he not get the world title. For our interest back home, we have Jordy Smith and Mikey February competing in the Pipe Masters. For Mikey it’ll be his last on the CT for a while, as he has not requalified for the 2019 season, but he could still impress with some funky moves that he is becoming so famous for. Jordy also has that randomness about him that could se him absolutely blow up and do some of the most radical surfing ever seen if he is having a good day, and for that reason alone he is worth it for the entertainment factor.